Keinton Mandeville lies some 5 miles to the North of Yeovil and is a small village of 350 houses. It has a thriving Primary school, Church, Chapel, 2 Public Houses, 5 shops, but it had no village hall! In 1992 a committee was elected to put this right, but to do this there was the small matter of £150,000 which we needed to raise. With the greatly valued assistance of the Community Council for Somerset, we were awarded substantial grants from the Somerset District and County Councils and from the Rural Development Commission. The Parish Council provided some excellent initial funding which allowed the project to start in the first place. Fund raising was difficult in the village without a venue in which to hold any events! In order to keep the costs to a minimum we used as much volunteer labour as possible. We purchased all the materials ourselves and hired craftsmen as they were needed. We were fortunate enough to have a building contractor on the village hall committee to advise and oversee all the site work. Mid 1995 we completed the purchased of the five acre site for the hall, car park and a future playing field. The hall is built on quarried land, so foundations had to dug down 2m to bed rock. We put this to good use by building a basement for storage under the whole building. 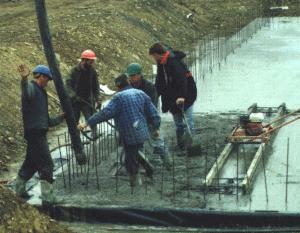 Early in 1996 saw all the excavation work complete and the picture opposite shows the concrete base being laid. That day work on the site continued until after midnight as the concrete surface was smoothed as it dried. During the summer of 1996 the basement walls were cast, the internal supporting walls built, and three large steel joists crained into position ready to support the floor of the main hall. 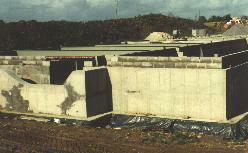 The picture opposite shows the basement towards the end of 1996, just before the block and beam floor was laid. The year started applying the bitumen sealant on the outside walls of the basement before we backfilled the site and the basement disappeared below ground level! The steel frame was erected in March and during May the above ground work started in earnest, as is shown opposite. Once the scaffolding was on hire, pressure was on to complete the remaining brickwork and roof. 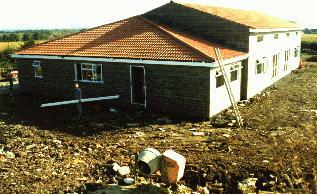 By October 1997 all the brickwork was complete and the roof, windows and doors fitted. We now had a secure watertight building which for the first time could be insured. 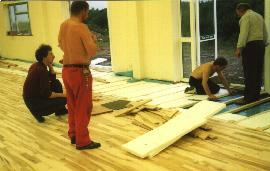 At the end of 1997 the internal walls were rendered and plastered, the ceilings fitted and the wiring well underway. 1998 saw the completing stages to the project. Mains electricity was connected at the end of January and we had light and power for tools without the need to use a portable generator. Plumbing and heating was installed during February, and the boilers commissioned during March - a day when it the snowed. With the heating working the plaster was dried out and the walls painted. The first event was booked for May so there was a last minute rush to lay the sprung maple strip floor in the main hall. The hall was ready on time for its first function, with all facilities fully functional! Six years after the Committee was first formed the hall was complete. The hall, together with fittings and all the services cost £131,000, and is valued at twice that figure. Thanks go to the 150 villagers who willingly gave their time to make this possible. 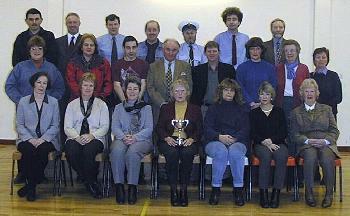 In the year 2000 the village hall won the Gwilliam Memorial Trophy for the innovation shown during the project. This was a suitable time to call together present and past committee members and some of the volunteers who had built and raised funds for the hall. The hall is in constant use during the week by village groups but is available for private hire on Friday evenings and during the weekend.